In the U.S. food and beverage industry, there is a presumption of quality and safety by consumers. Consider that in 2014, North America consumed 51.16 billion liters of carbonated soft drinks – all of which had to go through some type of sanitary strainer at some point. The burden of maintaining these high levels of product purity required by regulatory agencies often rests on the equipment used in their manufacturing process. As such, the use of sanitary strainers during the food and beverage production process must be understood. 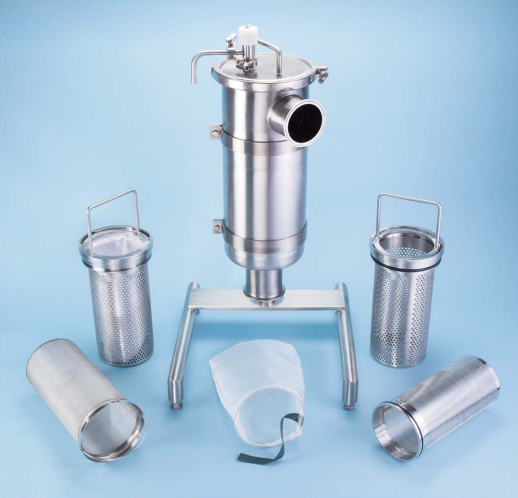 The need for sanitary strainers is simple and straightforward: they are used by the food and beverage industry to remove impurities from the liquid stream of their products. This improves product quality and ensures uniformity. Strainers are manufactured from stainless steel mesh (316L), but other corrosion resistant alloys can be used for processing highly corrosive fluids. The mesh is designed in many sizes and shapes, and is either woven or welded together. These screens are tightly woven to provide an adequate straining material. Polishing strainers to a very low surface roughness makes them extremely easy to clean, which is important for maintaining product safety. Any corrosion could lead to bacterial growth that causes contamination and potential health issues for consumers. Additionally, legal and regulatory sanctions are also possible as a result of such a breach in production hygiene. Which industry is the strainer being used? Product temperature, viscosity and line pressure are also important factors. Clogged strainers reduce throughput and eventually cause production stoppages. Often the use of a dual or duplex strainer unit is required, which permits the cleaning of one strainer while the other continues operation. The right strainer will perfectly maintain product integrity without compromising safety, quality or cost. SaniClean Strainers, a Newark Wire brand, manufactures a complete line of industrial sanitary strainers, assemblies, replacement parts, and filter media suitable for a wide range of applications and capacities. SaniClean Strainers are ruggedly built to withstand the most demanding production cycles. They are easy to clean and integrate into new or existing piping configurations. Contact us today for your next filtration project.